GREETINGS from Great Marton, here on the Fylde - Lancashire's Irish Sea coast. The July heatwave - said to be the driest and hottest in centuries - is set to end with rain and thunder forecast. No bad thing, I hear fellow gardeners remark down my local - Blackpool's oldest pub the Saddle Inn. For your rainy-day reading, I'm almost ready to publish my last and, to my mind, finest novel. 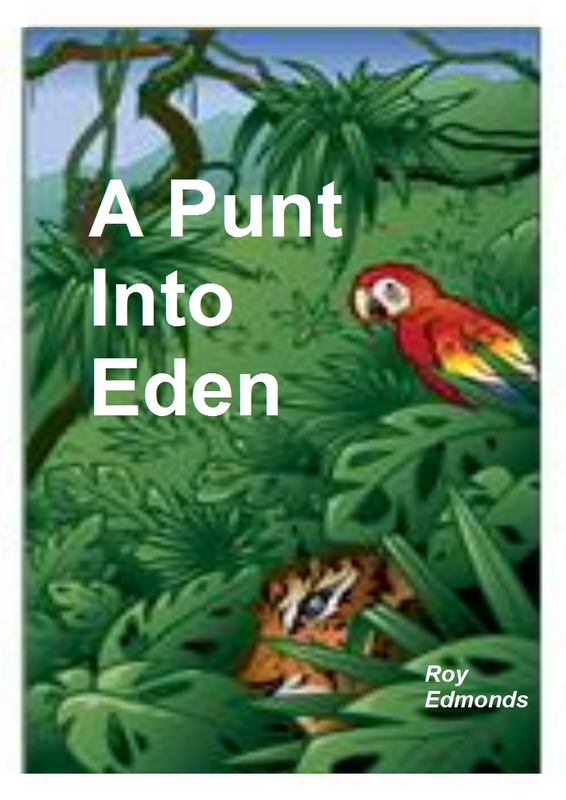 Originally entitled Over My Dead Body, it is set mainly in Sri Lanka and now renamed A Punt Into Eden. This better catches the story's gentle but uplifting spirit. It's an adult adventure story and romance running to 450 pages and should be generally available by September in paperback and Kindle versions (front covers illustrated left and below, respectively). 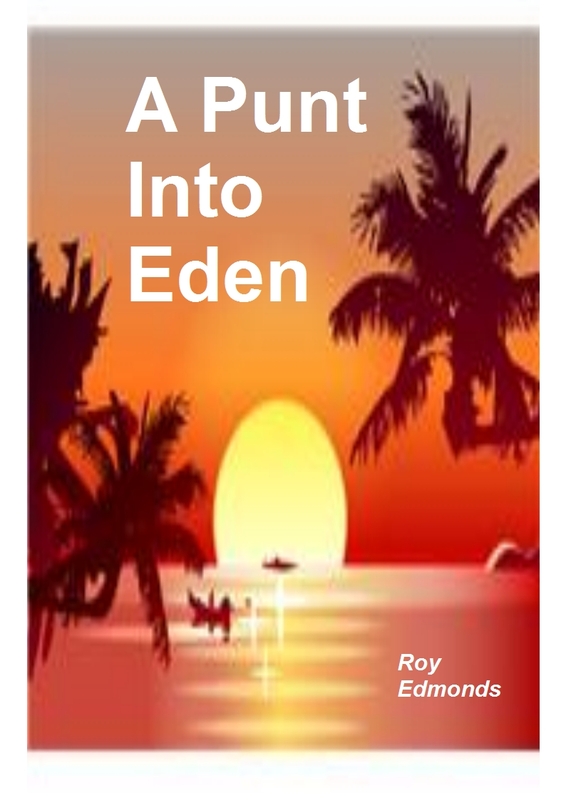 I have also updated our Chapter page with an extract from earlier novel Born Again Sinner (see also our Books page), which tells of another spiritual awakening leading to romance and adventure. Meanwhile, our Memoir page will shortly take you on tour from Singapore to East Malaysia. But I digress. Now, Heroes Return was a Government scheme with grants to former servicemen or their widows to revisit where they were posted in the Second World War. It enabled my mother-in-law, Wynne, to go to Sri Lanka where her husband served in the Intelligence Corps with Lord Louis Mountbatten. As Wynne is in her 80s, the scheme also allowed my wife (whom regular readers will know as She Who Knows) to accompany her. Furthermore, not trusting me to be left home alone, She Who also took me along. We stayed in Sri Lanka's oldest resort, Negombo, north of Columbo on the west coast. Our hotel was a modern beachside one but we also delighted in a colonial establishment, called Brown's, further down the coast and an historic tennis club. It was a journey back into a Raj-like past where it was possible for even an impoverished author to hire a driver for the day. Also we explored Dutch colonial canals into the jungle. 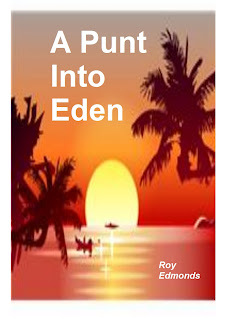 Our experiences echoed a gentle, lost era and pastiche of cultures that inspired my plot for A Punt Into Eden. Finally, I escorted my mother-in-law to the old hill capital of Kandy and, in its fine horticultural gardens, visited the bungalow, huts and offices once occupied by Mountbatten and his forces. As we were rejoining our driver outside the gardens, a friendly local inquired if we were enjoying our visit and on holiday. "I have just been visiting where my husband was based in the war," explained Wynne, "at Mountbatten's bungalow." "Ah!" He exclaimed, astonished and impressed. "Lady Mountbatten!" "Yes," confirmed Wynne, not quite hearing or understanding, "that's right, the Mountbatten's." "Wait please, lady!" He implored her, then, spreading the word, went off to get a local worthy. A turbaned, old boy with fine moustaches was wheeled out to greet us and a growing crowd gathered. "Lady Mountbatten!" They muttered in hushed, reverential tones. My mother-in-law, gracious and sociable as always, beamed regally - unwittingly playing her part in this escalating misunderstanding. It was all too far gone for me to intercede. Besides, the old, bewhiskered chap seemed most impressed - and our understanding driver Gupta greatly amused. In time I managed to lure Wynne away into the back of our waiting Wolseley saloon. As we left she waved majestically to the substantial crowd. "What friendly people they are," she commented, "quite extraordinary!" Yes, it was - and I hope you will find the forthcoming book just as enjoyable.